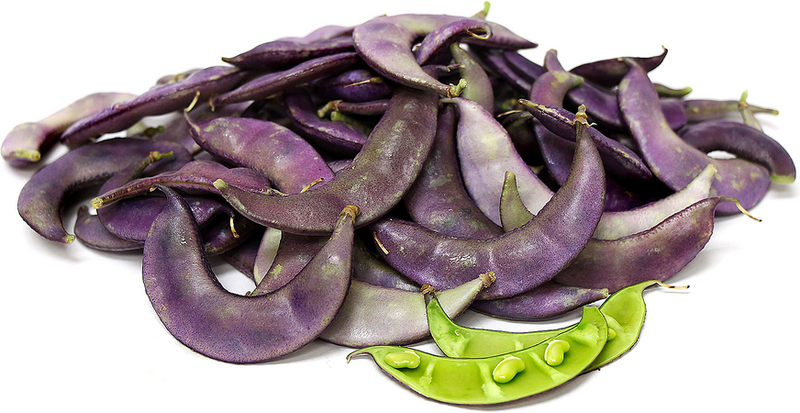 Ruby Moon beans are dark purple ornamental bean pods that grow on long green trailing vines. The pods are a deep purple to maroon color on the outside and a bright, vivid green on the inside. They they are malleable and lie flatter against the seed, like Sugar Snap peas. Immature Ruby Moon beans are edible, though they may not taste as good as most other beans. The pods contain toxic cyanogenic glucosides, antimicrobial agents the plant produces that create bitter taste in defense against hungry herbivores. Ruby Moon beans appear on their vines in mid to late-summer. Botanically Dolichos lablab, Ruby Moon bean is also known as ‘Lab Lab’, an aboriginal name, or ‘Purple Hyacinth’ beans. The deep purple pods grow on trailing vines that have small purple or white flowers. Ruby Moon beans are not true beans; they are more closely related to the pea. Ruby Moon beans have to be very carefully prepared, otherwise they can be poisonous. They are not recommended for consumption. The immature beans and flowers are used as a vegetable in Africa. The mature beans must be boiled and drained several times in order to rid the bean of its toxin. Ruby Moon beans will lose their color when cooked, and turn a more modest green. Native to Africa, Dolichos lablab are grown in both south-east Asia and eastern Africa as a pulse crop (legumes harvested for both animal and human consumption) like soy. Thomas Jefferson grew the purple hyacinth beans, Ruby Moon, as his Monticello estate in Virginia. It is a fairly cold hardy vine and is grown in most areas where temperatures don’t dip below zero degrees.